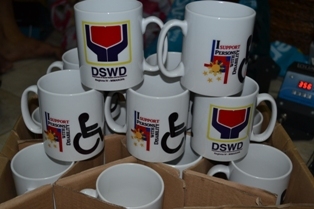 HUGS AND MUGS…Determined to usher in 2014 with a strong promo pitch to ‘MAKE THE RIGHT REAL’’ for and with persons with disabilities, DSWD IV-B gave away disability mugs to thank all partners in government, private and people’s organizations. The Regional Committee on Disability Affairs (RCDA) IV-B/MIMAROPA is led by its Chairperson DSWD IV-B Regional Director Wilma Naviamos, and one of the 17 RCDAs run by the National Council on Disability Affairs (NCDA) as disability monitoring arms in all regions. Represented by her focal person Nieves _Amandy, the Committee capped its December 10, 2013 interagency meeting with resolutions creating 3 Subcommittees on 1) Accessibility, 2) Employment, Livelihood and Training and 3) Advocacy, following reports of accomplishments and disability updates from the NCDA provided by RPC Ruth Tacujan. This aims to create ‘‘functional’’ disability structures that would push in a big way, a disability-inclusive society where persons with disabilities could productively participate alongside fellow citizens, based on the Council’s performance contract with the President. RCDA IV-B holds the record of formulating action plans as early as January this year, anchored on the “Incheon Strategy Goals” which makes it very much ‘’in step’’ with the President’s recent signing of P.D. 688 known as “MAKE THE RIGHT REAL DECADE FOR PERSONS WITH DISABILITIES”.